When you open your Excel 97-2003 file in Excel 2007-2013, one that creates its own menus, the first thing you notice is that you don't see your menus. Where'd they go? Then you discover them - shunted over on the Add-ins tab. Not exactly the ideal user interface. How are your users going to find them there? What you want is an application that runs as a first class citizen in Excel 2007-2013, one that takes full advantage of the ribbon, and yet runs as it always did in Excel 2003. Yet you do not want to maintain two versions of your app. Two versions are always a nightmare, so difficult to keep in sync. So, is this possible? Is it possible to have one version that's at home in Excel 2007-2013 and Excel 2003? Yes it is, here's are three approaches to this problem that you can try. Every download on this page has two type of files in it. The Excel 97-2003 file(s)and an Excel 2007-2016 Add-in. The 2007-2016 Add-in must be in the same folder as your Excel 97-2003 file. 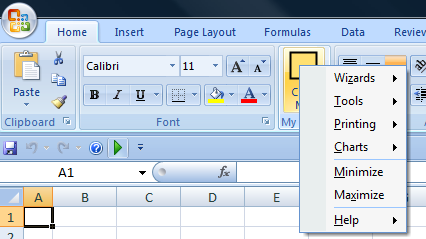 When you open the xls file in Excel 97-2003, it will create a menu in the worksheet menu bar with VBA. In Example 3 you see that it is also possible to use the same add-in for more Excel 97-2003 files. Read the information in that section after you try the first two examples in the download on this page. You can use the table in the menu worksheet to change the menu, there is no need to change the RibbonX or the VBA code in this example. Impossible to make it easier I think? Read the information on the worksheet how you can unhide the menu worksheet. You can edit the menu in the table on this worksheet after you do that. If you use this example you have much more control. You can build a custom Ribbon tab with all the buttons you want and create a menu with the same options for Excel 97-2003 with VBA code. 2: How to write RibbonX to build a custom Ribbon tab. 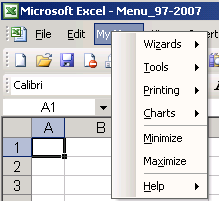 In Excel 97-2003 it will create a menu in the Worksheet menu bar. In Excel 2007-2016 the RibbonX in the Add-in add a group on the Home tab with a Dynamic menu control, but no menu items (Install the add-in as a normal add-in so that it is always open). Note: you use the same Add-in for every workbook that use this technique. In the VBA code we create the RibbonX string to build the menu so you can do everything in the VBA editor in this example (See the mRibbon module). The RDBdynamicMenuContent callback create the menu items in the Dynamic menu. In the download there are also two xls workbooks for testing, one with a small English menu and one with a small Dutch menu. When you switch between the two workbooks you see that the menu change between Dutch and English and if you make a new or other workbook active the group on the Home tab on the ribbon will disappear. You can make a total different menu for each workbook but to test I choose Dutch/English captions.